After almost 3 years going strong, my 360 bit the big one this morning about a quarter of the way through a rally race in Dirt. Ugh. 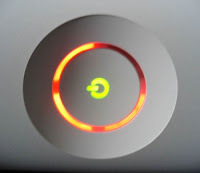 I'm actually surprised it lasted this long, seeing as all of my friends have already lost a box to the cursed Red Ring of Death. That, and there's the fact that my original Xbox was one of the first to go, leading to the annoying reboots during Halo 2 matches that left my name hanging in the lobby and the subsequent chants of "Rogue, Rogue, Rogue, f@#* you!". The worst part is that I was really looking forward to blowing some of my vacation next Friday and having a Gears of War 2 marathon. I guess that party is on hold for a while, while I wait for my coffin to arrive so I can ship back my little while waffle maker for repairs. Maybe, just maybe, I'll get lucky and get a box back with an HDMI port on it. I can dream, right? If I went and bought one, and brought it over, would you still take the day off?